According to CBO’s estimates, with enactment of H.R. 1, the number of jobs would be between 0.8 million and 2.1 million higher at the end of this year, 1.2 million to 3.6 million higher at the end of next year, and 0.7 million to 2.1 million higher at the end of 2011 than under current law. As this Times analysis nicely explains, the components vary in their speed and effectiveness - the spending has a higher multiplier than the tax cuts, but some of the spending will take longer to implement. The Tax Policy Center has graded the effectiveness of the tax provisions; they give a B+ to the centerpiece "making work pay" refundable tax credit of $500 for individuals and $1000 for couples, while the corporate tax breaks mostly get lower grades. At Econbrowser, Menzie Chinn plots the CBO's estimate of spending over time (bear in mind that the CBO's estimates are for the federal government's fiscal years, which begin in October, not January, so we're almost half way through FY 09). A detailed outline of the bill has been posted by Speaker Pelosi's office. Is it just me, or does this smell like a parting shot at cheese-eating surrender monkeys? Update (2/1): The Economist's Free Exchange says: "Yes, while Europeans will be relishing delicious bleu cheese, Americans can eat hormone-injected beef with a side of stale freedom fries." From Davos, of all places, the Times reports: Don't forget to include their running-dog lackeys. Even apart from the instability due to speculation, there is the instability due to the characteristic of human nature that a large proportion of our positive activities depend on spontaneous optimism rather than on a mathematical expectation, whether moral or hedonistic or economic. Most, probably, of our decisions to do something positive, the full consequences of which will be drawn out over many days to come, can only be taken as a result of animal spirits - of a spontaneous urge to action rather than inaction, and not as the outcome of a weighted average of quantitative benefits multiplied by quantitative probabilities. Enterprise only pretends to itself to be mainly actuated by the statements in its own prospectus, however candid and sincere. Only a little more than an expedition to the South Pole, is it based on an exact calculation of benefits to come. Thus if the animal spirits are dimmed and the spontaneous optimism falters, leaving us to depend on nothing but a mathematical expectation, enterprise will fade and die; - though fears of loss may have a basis no more reasonable than hopes of profit had before. Whatever happens in the world economy, developing countries always seem to get the worst of it. After the financial crises of the late 1990's, many "emerging market" countries sought to reduce their dependence on fickle financial inflows by building up reserves. This entailed running trade surpluses - selling goods in exchange for financial assets - with the perverse implication that low-income countries were net lenders to the US and other high-income "surplus" countries. Emerging economies who thought that they had protected themselves from sudden swings in capital flows by maintaining large reserves and running large external surpluses are discovering that their efforts to reduce their exposure to volatile global capital flows added to their exposure to a global slump in trade. Gov. Strickland, Hold that Axe! Those pieces alone add up to about $7bn for Ohio, and that is not including some of the other major elements, such as infrastructure spending and tax cuts. So it looks like the help from Washington could go a long way towards closing the state budget gap, which is projected to be $7.3bn for the 2010-11 fiscal year. Do We Need An Insurer of Last Resort? For quite some time, but in particular since the late 1990s, the world has experienced a chronic shortage of financial assets to store value. The reasons behind this shortage are varied. They include the rise in savings needs by aging populations in Japan and Europe, the fast growth and global integration of high saving economies, the precautionary response of emerging markets to earlier financial crises, and the intertemporal smoothing of commodity producing economies. The immediate consequence of the high demand for store-of-value instruments was a sustained decline in real interest rates. Conventional wisdom blames these low rates on loose monetary policy, but this position is difficult to reconcile with facts from the period of the so-called “Greenspan conundrum’’ – when tightening monetary policy had virtually no impact on long rates. In my view, the solution to the apparent conundrum is that low long rates were driven by the large demand for store-of-value instruments, not short-term monetary policy considerations. Under this perspective, there is a more subtle angle on subprime mortgages than simply being the result of unscrupulous lenders. The world needed more assets and the subprime mortgages were helping to bridge the gap. So far so good. However, there was one important caveat that would prove crucial later on. The global demand for assets was particularly for very safe assets – assets with AAA credit ratings. This is not surprising in light of the importance of central banks and sovereign wealth funds in creating this high demand for assets. Moreover, this trend toward safety became even more pronounced after the NASDAQ crash. Soon enough, US banks found a “solution” to this mismatch between the demand for safe assets and the expansion of supply through the creation of risky subprime assets; the market moved to create synthetic AAA instruments. This consisted of pooling subprime mortgages on the asset side of a Structured Investment Vehicle (SIV), and to tranch (slice) the liability side to generate a AAA component buffered by the now ultra volatile “toxic” residual. The latter was then pooled again into Collateralized Debt Obligations (CDOs), tranched again, and then into CDO-squared, and so on. At the end of this iterative process, many new AAA assets were produced out of some very risky subprime mortgages. Essentially, the US (and other) financial markets are experiencing the modern version of a systemic run as we had not seen since the Great Depression. It used to be that depositors ran from banks. Some of this still happens, but runs in modern financial markets, to be systemic, have to involve a larger class of assets. A run against explicit and implicit financial insurance is essentially a run against virtually all private sector financial transactions but for those with the shortest maturities. Thus, the modern lender-of-last resort facility has to be a provider of broad insurance, not just deposit insurance. This is what it will take to get us back into a reasonable equilibrium where we can initiate a recovery from a (more) “normal” recession. We will see if the second round of the TARP and future Fed improvisations incorporate more of an insurance component, which would involve the government taking on more contingent liabilities, rather than spending directly (which might be a way of getting around budget limits imposed by Congress, for better or worse). One thing we can be sure of is that the ballooning deficit means that the federal government will be making plenty of safe assets (Treasury bonds) available. 1982 also saw a bottoming out of the stock market, Floyd Norris recalls. ...I have argued that higher education, properly understood, is distinguished by the absence of a direct and designed relationship between its activities and measurable effects in the world. Except in a few private wealthy universities (functioning almost as museums), the splendid and supported irrelevance of humanist inquiry for its own sake is already a thing of the past. He goes on to discuss the argument of a new book, "The Last Professors: The Corporate University and the Fate of the Humanities," by Frank Donoghue. One of the main supporting pieces of evidence is the growing use of adjunct and temporary faculty. That may reflect shifting priorities, but I would partly attribute it to Baumol's cost disease - the relative cost of personally delivered services has tended to rise over time because their productivity growth is slow. That is, the price of professors relative to cars has risen, because the manufacture of cars requires much less labor than it did a generation or two ago, while teaching requires about the same amount of human effort. 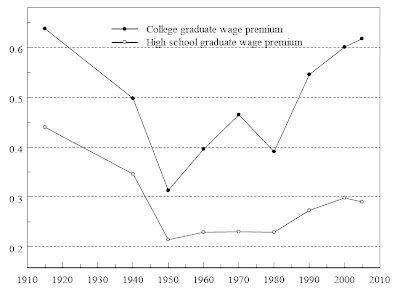 I think the broader problem, what Fish describes as a "shift from a model of education centered in an individual professor who delivers insight and inspiration to a model that begins and ends with the imperative to deliver the information and skills necessary to gain employment," is more a consequence of the increasing college wage premium. (figure swiped from Goldin and Katz). Because the gap in earnings between those who hold college degrees and those who don't has grown significantly over the past several decades, young adults (and their parents) have come to regard college as a stepping stone - or obstacle - to "success." It is not surprising that they therefore believe that universities should deliver some sort of "useful" job-specific knowledge. But the education kids are rewarded for may not be the same education their parents think they are paying for. Economists would say that a college degree is partly a “signaling” device — it shows not that its holder has learned something but rather that he is the kind of person who could learn something. Colleges sort as much as they teach. Even when they don’t increase a worker’s productivity, they help employers find the most productive workers, and a generic kind of productivity can be demonstrated as effectively in medieval-history as in accounting classes. Another argument, that I have made before, is that liberal education develops broadly applicable skills, like critical thinking and writing. But Fish's view is the one that I like best, that seeking to understand and interpret the world is an enterprise of intrinsic value. I hope someday the college wage premium will disappear, so we can overcome the confusion about what we are really here for. High Future Energy Prices Now, Please! But the return of cheap gasoline has already dampened hybrid sales. Throughout the show, auto executives emphasized that stable fuel prices, or a coherent government energy policy, would help them anticipate what consumers would buy next. Because of wild swings in fuel prices, “Every six months we get called stupid for having the wrong products,” said Robert A. Lutz, G.M.’s vice chairman. Electric cars did generate the show’s central irony: the models that will most impress Detroit’s new overseers in Washington will also drag down the automakers’ bottom lines for several years. But by failing to raise the gasoline tax, the president-elect risks complicating another problem: Fixing the U.S. automobile industry. Here's the problem. Obama and leading members of Congress keep saying they want ailing automakers to make more fuel-efficient vehicles. But the automakers in the past made more money on the guzzlers; in the future, they will have trouble charging enough to make money on new cars using costly new technologies for plug-in or hybrid cars. So the car company of the future may be a money-losing operation, just like the car company of the present. Raising the gasoline tax would increase consumer demand for more fuel-efficient vehicles. That could help automakers charge more for them and make more money on sales of plug-ins, hybrids or more efficient conventional engines. Not surprisingly, Ford and General Motors both belong to the U.S. Climate Action Partnership, which this week proposed a detailed blueprint for a cap-and-trade system for carbon dioxide emissions. Such a system would put a price on carbon and would effectively tax gasoline and all other fossil fuels. After being burned last summer by sky-high gasoline prices, do Americans really need higher gasoline taxes to get them to buy fuel-efficient cars? Yes, actually. Americans have an astonishingly short memory about gasoline prices. Sales of the Toyota Prius have hit the skids now that gasoline prices are back below $2 a gallon. And sales of SUVs are relatively strong compared to many other models. (Hat tip: Mankiw). The principle applies more broadly - the best way to induce investments in "green" technology would be policies that credibly ensure that the price of (non-renewable) energy will rise in the future, like a phased-in carbon tax. Done right, this could even have a positive effect on current investment by creating an incentive to replace inefficient equipment before the higher costs kick in. That is, a (future) tax increase could be a stimulus today... not to mention addressing a problem - global warming - that is ultimately far more serious than the recession. Politically, it isn't an easy sell, but it should be less difficult now, in the wake of a fall in global energy prices, than it will be once they go back up. Chu's comments were not encouraging, but presumably a climate/energy proposal is in the works that will result, perhaps indirectly, in higher costs for transportation fuel. Still, I worry Matthew Yglesias may be right when he says: "my best guess is that Obama’s climate proposals are too ambitious to be enacted and too timid to avert catastrophe." But if he's wrong, and we get the high energy prices we need, Bob Lutz has got me covered. There's been a lot of grousing lately about the Treasury's $700 billion bailout program, which, according to its many critics, has accomplished nothing other than line the pockets of undeserving bankers and their shareholders. Maybe I'm missing something, but I don't see how it's possible to rescue the banking system without rescuing banks. That's not because anyone thought banks or bankers were particularly deserving of public charity or even sympathy -- clearly they weren't. But by last summer, with investors, lenders and depositors running for the exits, there was a genuine fear that the banking system could collapse and bring the whole global economy down with it. To prevent that outcome, the Treasury asked for $700 billion that it could use not only to mount rescues of individual institutions, but also to try to get ahead of the crisis by taking proactive steps to shore up the financial system. Indeed, Calculated Risk finds that some measures of credit market stress have improved considerably. So this looks like an estimate from the Obama team itself saying — as best as I can figure it out — that the plan would close only around a third of the output gap over the next two years. I agree with Paul that this fiscal boost plan is too small, but I do want to admit that doing this well is harder than it looks. The tax-cut part does not look terribly effective as a stimulus--it is a step toward compensating for higher income inequality and a political play to make it more likely that Republicans will lose politically by trying to block the package rather than a significant boost to employment. Thus I do not think you would want to make the tax-cut part larger. 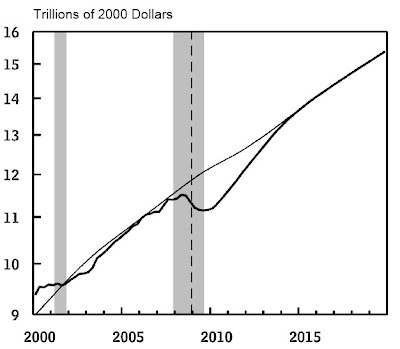 And it is hard to find a lot of additional spending projects that can be ramped up quickly and do a lot of good--relatively soon in that endeavor the short-term fiscal multiplier falls below one. They are trying their best. At Econbrowser, Menzie Chinn notes that, with the output gap expected to last for a while, we shouldn't be so concerned with the "lags" in implementing infrastructure spending (a point also made by Krugman in this column). The implicit assumption here seems to be that the recovery will be slow, as it was following the 1990-91 and 2001 recessions. In both of those cases the unemployment rate continued to drift upward after the business cycle peak declared by the NBER. In terms of magnitude, it looks like we're now in a more serious recession, comparable to 1973-75 and 1981-82. 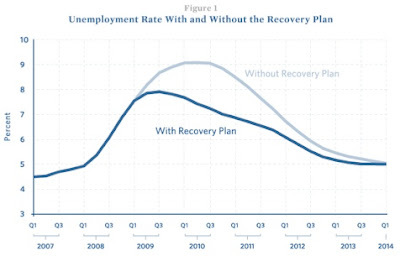 Those recessions had bigger spikes in unemployment, but also much brisker recoveries. Unemployment peaked at 10.8% in December 1982 and fell to 8.3% at the end of 1983 - a decline of 2.5 percentage points in 1 year. 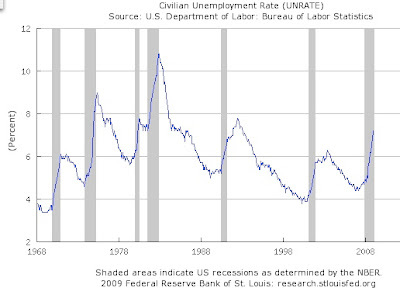 The unemployment rate declined 1.6 points from May 1975 (9.0%) to May 1976 (7.4%). In both cases, the recoveries were quicker than what is envisioned by Romer and Bernstein or by the CBO. It may indeed be that the 'jobless recovery' is the new 'normal' pattern. If the dynamics of earlier recessions were driven by manufacturing firms responding to unintended inventory accumulation, improvements in inventory management and the declining share of manufacturing might help explain the changing pattern. However, part of the reason economies can bounce back quickly (Milton Friedman once compared recessions to plucks of a guitar string) is that idle resources can be put back to work fast. And it looks like we will have no shortage of idle resources this time around. But although the [classical] doctrine itself has remained unquestioned by orthodox economists up to a late date, its signal failure for purposes of scientific prediction has greatly impaired, in the course of time, the prestige of its practitioners. For professional economists, after Malthus, were apparently unmoved by the lack of correspondence between the results of their theory and the facts of observation; - a discrepancy which the ordinary man has not failed to observe, with the result of his growing unwillingness to accord to economists that measure of respect which he gives to other groups of scientists whose theoretical results are confirmed by observation when they are applied to the facts. “Most of our models are structured in a way that the economy is self-righting,” said Nigel Gault, chief domestic economist for IHS Global Insight, a consulting and forecasting firm in Lexington, Mass. That said, though I haven't hazarded any forecasts, I have also been of the belief that the gloominess has been overdone. My reason for optimism is that we seem to be re-learning our Keynesian lessons quickly (most of us, anyway - there are some exceptions of course) and enough of the madmen in authority are on board that we can expect monetary and (soon) fiscal policy to be conducted with due regard for the principle of effective demand. Marginal Revolution is soliciting nominations for the most famous mistakes of economics. My personal favorite is William Baumol's 1986 American Economic Review article "Productivity Growth, Convergence, and Welfare: What the Long Run Data Show" (link requires JSTOR subscription). In it, he finds that GDP data for 16 countries over the period 1870-1979 validates the convergence prediction of neoclassical growth models. That is, initially poor countries grow faster than rich ones, thereby catching up over time. Looks good, but as Brad DeLong pointed out in "Productivity Growth, Convergence and Welfare: Comment," (AER, 1988 [JSTOR]) the finding suffers from a selection problem. 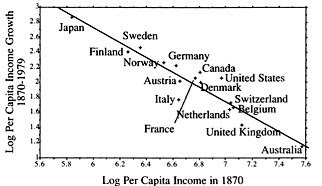 All of the countries in the sample are wealthy in 1979, so, of course, if they started out poor, they caught up. 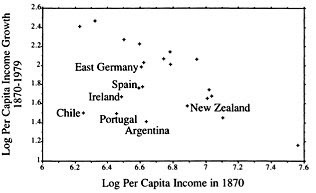 As a way around, with limited data, DeLong instead chooses a sample based on the initial level of income in 1870. Doing so adds several countries like Portugal and Argentina, that did not converge. Some of the nominees at MR have much more cosmic importance, but this case is a good example of how smart people - not just Baumol, but the editors and referees at AER, too - can make mistakes that seem obvious, but only in retrospect after another smart person points them out. To be fair, it should be mentioned that Baumol did mention the potential issue in a footnote.